Our procedure begins with a complimentary consultation, a specialized assessment of hair loss and a recommendation for an appropriate procedure. The Sunetics bio-stimulation laser international medical advisory board consists of the leading board certified cosmetic surgeons who specialize in hair restoration procedures. Highly respected medical professionals who have contributed to this research include: Dr. Alan Bauman, Dr. S. Friedman, Dr. Robert Reese, Dr. Yves Crassas, Dr. V Gambino, Dr. William Yates and Dr. Edwin Epstein. These specialists collectively concluded that the Sunetics laser is the best on the market. At Advantage Laser Clinic in Toronto we use the Sunetics Bio-Stimulation laser for hair rejuvenation which is a 650nm laser for hair restoration. This low level laser therapy (LLLT) is FDA approved for hair rejuvenation. The laser penetrates into soft tissue in the scalp and increases nutrient absorption and cellular adenosine triphosphate production (ATP). ATP synthesis dramatically increases the mobilization of calcium ion (Ca2+) and cell signaling cascades that lead to increased protein production, intracellular nutrient acquisition, and cell proliferation. This process ultimately leads to a decrease in DHT-dependent disruption of follicular protein and nutrient loss which results in a healthy scalp, healthy, shiny, thick hair and hair loss prevention as well. Normally a series of treatments are required for best results. Initially 2-3 treatments are required weekly for the first 4-6 weeks of the hair loss program. Following the initial 4-6 weeks, one would continue treatment on a weekly or bi-weekly basis depending on the severity of the condition. 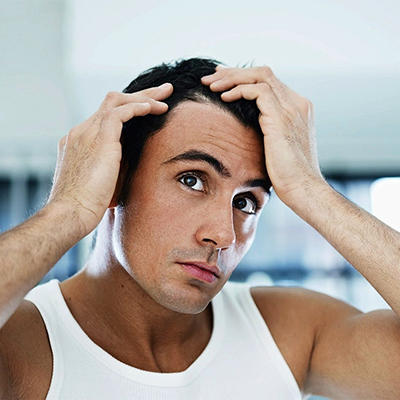 Hair loss treatments are approximately 20 to 30 minutes. The hair restoration laser is best described as a warming sensation which is comfortable and pain free. To compliment your treatments, speciality hair products may be used in combination with clinical treatments to enhance results.